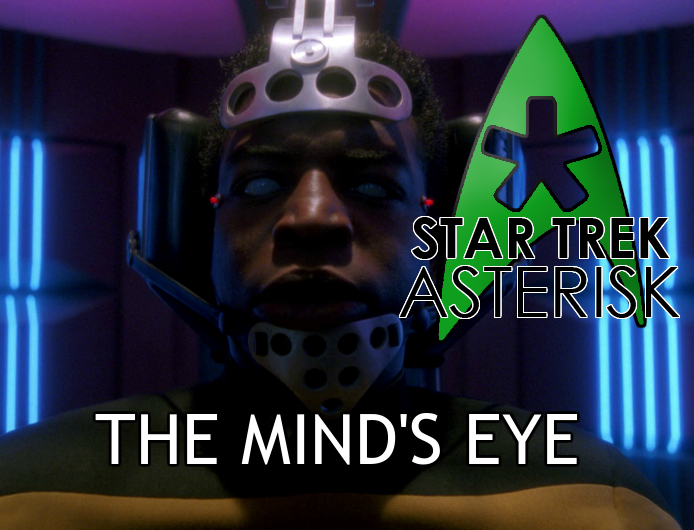 Star Trek: Asterisk "The Mind's Eye"
Geordi is brainwashed to be a sleeper agent for the Romulans and kill a Klingon to start an interstellar war. While on his way to Risa for a nice relaxing artificial intelligence seminar in a shuttle, Geordi plays an engineering trivia game with the computer until he turns around and sees ROMULANS OFF THE BOW! He tries to react, but before he's able, he's transported into the wobbly green ship. 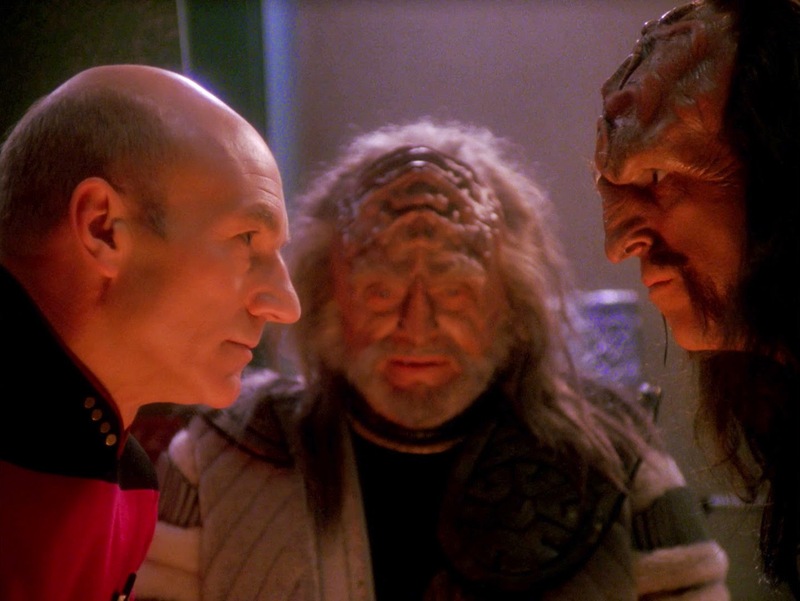 Meanwhile, back on the Enterprise, Picard is meeting with Ambassador Kell, a Klingon tasked with quelling a rebellion in the Kriosian system which seeks independence from the Klingon Empire. The governor of Krios claims that the Federation has been aiding the rebellion with weapons, and since that's something the Federation would never do, Kell personally requested Picard to accompany him to sort it all out. Of course, Worf would be the perfect person to help out with all of this, right? Who better than a Klingon chief of security to accompany Kell and look over the evidence of Federation weaponry? Of course, Kell reminds Picard, Worf's discommendation makes that... very awkward. But Worf and Picard are a package deal. If Kell wants Picard, he gets Worf, too. Meanwhile, on the Romulan vessel, Geordi gets strapped into a chair and greeted by Romulans. A fair look-alike is brought in to wear a replica of Geordi's VISOR and sent to Risa in his place, so no one will be the wiser. The chair accesses Geordi's visual cortex through the VISOR inputs and feeds images to him. Specifically, images of others suffering. 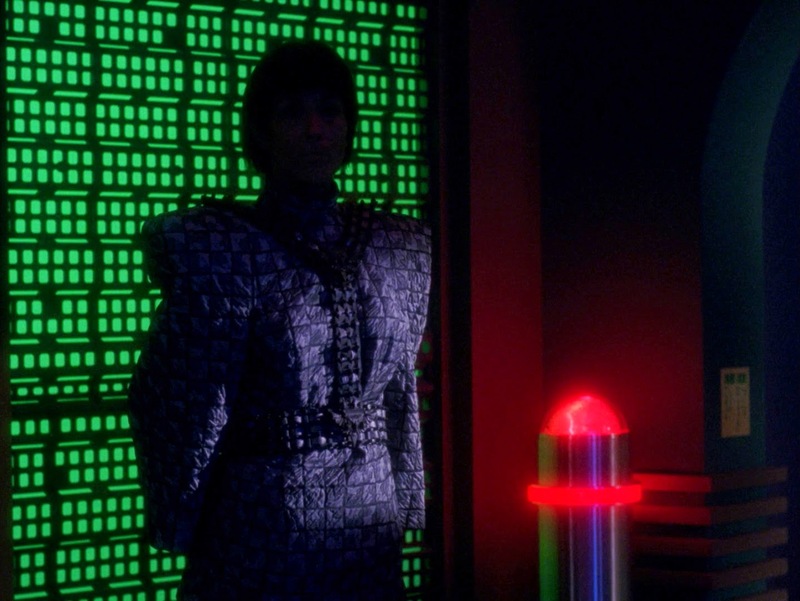 In the background, a mysterious female Romulan observes from the shadows. This couldn't possibly be someone we know! Back on the Enterprise, Kell and Worf work together to find the rebels on a star map, and Kell tests Worf to see if he would betray Picard by asking about the alleged Federation aid. Worf defends himself honorably, and Kell tells him that he acted like a "true Klingon" when he killed Duras and received discommendation. Back on the Romulan ship in a holodeck recreation of Ten Forward, the Romulan commander tells Geordi to kill holo-O'Brien. He hesitates a little, but with a little more persuasion, his brainwashing kicks in and he activates a phaser on the image of his good friend. Because of the hesitation, the Romulan commander instructs his underlings to set up the equipment for another session. And that session lasts just as long as the commercial break! Geordi is not back on the Enterprise and happily converses with Data as he exits a shuttle. He seems to have all memories of Risa, and not the Romulan ship. Picard and Riker tell him that they'll need his help analyzing the evidence they're about to receive, but before Picard can meet with the governor of Krios, Vagh, Data picks up some strange E-band emissions. Down on Krios, Vagh throws what appears to be a Federation phaser rifle at Picard as evidence that the Federation is aiding the rebels. Vagh further antagonizes Picard by calling him a liar, to which Picard retorts back in the Klingon tongue. This is taken very well by Vagh, but further work is still necessary. "You swear well, Picard. You must have Klingon yogurt blood in your veins"
Geordi then goes to the real Ten Forward and spots O'Brien. He approaches him and... spills a drink on his shoulder... oops? In Engineering, Geordi and Data test the phaser rifle that Picard got from Vagh. It seems to check out as a Federation weapon except for one variation... The emission crystal is too efficient. The most likely government that has the most to gain from a conflict between the Federation and the Klingon Empire? Romulans. Geordi reports this back to Picard and the Klingons, and that's when it's made clear what Geordi's real mission for the Romulans must be... Meanwhile, Data's still looking for the source of those E-band emissions. And Geordi transports more weapons to the rebels. Vagh doesn't take that very well. Geordi rushes to figure out how the weapons were transported, apparently not even knowing he was the one who did it. He traces the transporter pattern to Cargo Bay 4 and checks things out. Only a few people could have done it, he finds, and Worf asks him where he was, but he insists he was in his quarters. 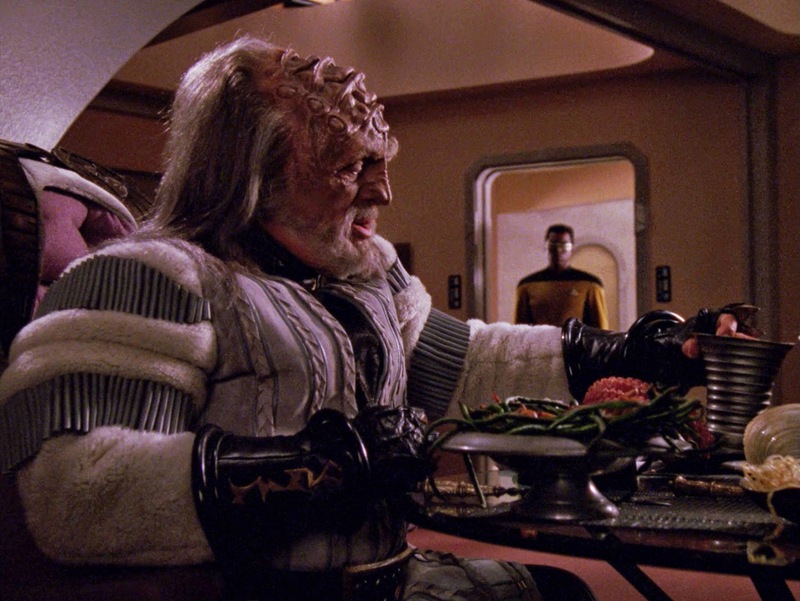 Then, while Kell is in his quarters enjoying a lively Klingon meal, Geordi enters and receives his orders. Kell tells Geordi to kill Vagh while they're in the cargo bay in front of Picard and many witnesses. Kell is the Romulan spy! The Romulans and Klingons always did have a weird relationship. Eat like a Klingon, live for a day. The next day, Picard accompanies Kell and Vagh from the transporter room and to the cargo bay. On the bridge, Data's still working on those E-band emissions. He and Riker believe they're a covert form of Romulan communication. The computer notes that they're similar to human brainwave patterns, and says that they could be made to fit a device that it describes to be very much like a VISOR. In the cargo bay, Geordi grabs a phaser and approaches Kell and Vagh. Data examines the shuttle that Geordi took to Risa to confirm his theory. Geordi moves closer to Kell and Vagh. Data tries to reach him and fails. Data calls Worf and tells him to take Geordi into custody. Worf tries to protect Kell, but the Klingon guards engage Worf in a fight. Geordi raises his phaser, but Picard knocks it out of the way JUST IN TIME! Data arrives and explains everything. The E-band emissions were going directly to Geordi's brain to command him. These emissions needed to come from close range. The only one able to do it: Ambassador Kell. This episode was based on "The Manchurian Candidate." The 1962 version, not the Denzel version. The director tried to get an actor from that movie to appear in this episode, but it never happened. Instead, he used a few choice scenes to parallel the movie and pay homage. I personally haven't seen the movie, but if this episode is any indication of its greatness, I look forward to seeing it one day. This was a fantastic demonstration of Romulan deceit, Klingon honor, Romulan/Klingon relationships, and little speck of a surprise yet to come with that mysterious female Romulan. If you want to know the political situation in the Star Trek: The Next Generation universe, you watch this episode. Watch it, and then look up who Sela is. Or, better yet, keep watching the following episodes. Also, it's not explicitly stated, but I have a theory that the look-alike that went to Risa in Geordi's place collected memories on Risa to be transferred back to Geordi's brain. Yes?